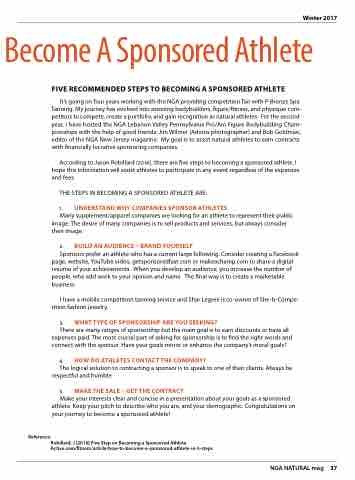 Sponsors prefer an athlete who has a a a a a a a a a a a a a a a current large following Consider creating a a a a a a a a a a a a a a a Facebook page website youTube video getsponsoredfast com com or or or makeachamp com com to share a a a a a a a a a a a a a a a a a a a a digital resume of of your your achievements When you you you you you develop an an audience you you you you you increase the number of of people who add work to to your your opinion and name The final way is to to create a a a a a a a a a a a a a marketable business I I have a a a a a a mobile competition tanning service and Shar Legree is co-owner of She-Is-Compe- tition fashion jewelry 3 WHAT TyPE OF SPONSORSHIP ARE yOU SEEkING? There are many ranges of of sponsorship sponsorship but the the main goal is is is to to earn discounts or or or or or have all expenses paid The The most crucial part of of asking for sponsorship sponsorship is is is to to find the the the the right words and connect with the the the sponsor sponsor Have your goals goals mirror or or or or or or or enhance the the the company’s moral goals? Make your your your your interests clear and and concise in in a a a a a a a a a a a a a a presentation about your your your your goals as a a a a a a a a a a a a a a sponsored athlete athlete Keep your your your your your pitch to to describe who you you you you you you are and and your your your your your demographic Congratulations on on on on on on on your your journey to to become a a a sponsored athlete!